Why can't we see this movement in the red figure? Curve studied by Bowditch in 1815 and by Lissajous in 1857. Nathaniel Bowditch (1773-1838): American mathematician and sailor. Jules Lissajous (1822-1880): French physicist. The Lissajous curves are the trajectories of a point the components of which have a sinusoidal movement. as well as of the cylindric sine waves of parameter 1/n: . The curve whose reduced parametrization is in the header is indeed the projection on xOy of the cylindric sine wave of axis Oy and parameter n and the projection on xOy of the cylindric sine wave of axis Ox and parameter 1/n . If n is irrational, then the curve is dense in the rectangle . Algebraic curve of degree 2q if when p is odd and when p is even. Portion of an algebraic curve of degree q if when p is odd, or if when p is even. The number of double points is, in general, equal to (p–1 groups of q points aligned on lines parallel to Ox, in blue opposite, and q–1 groups of p points aligned on lines parallel to Oy, in green opposite). In the case where the curve can be described in both directions, then there are double points. We get a portion of the plot of the n-th Chebyshev polynomial Tn when n is an even integer, and when n is an odd integer, . : lemniscate of Gerono : portion of a parabola. Portion of the divergent parabola with equation: . See here a tied version of it. 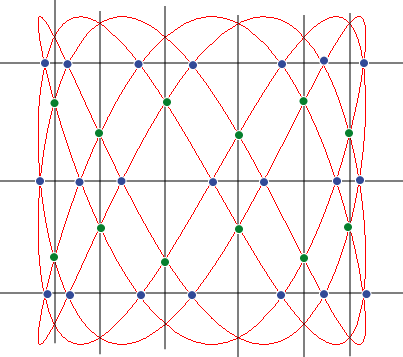 The Lissajous curves have the same topology as the curves of billiard balls in a rectangular billiard table. One can also imagine "Lissajous curves in polar coordinates", with polar parametrization: ; opposite the case p = 3, q = 7, (idea of Ch. de Rivière). This beautiful doormat does not follow exactly a Lissajous curve. 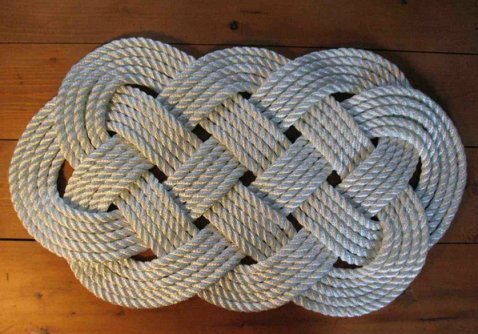 Yet, if in the Lissajous curve , you follow the blue "bridges" opposite, you get this doormat. See an interpretation on this page. See also the 3D Lissajous curves, and the basins.